Yesterday I ended my day with a feeling of amused frustration. I received a new iPhone Xs as part of the Apple upgrade program.1 I've used this plan in the past and I've been happy with the results. 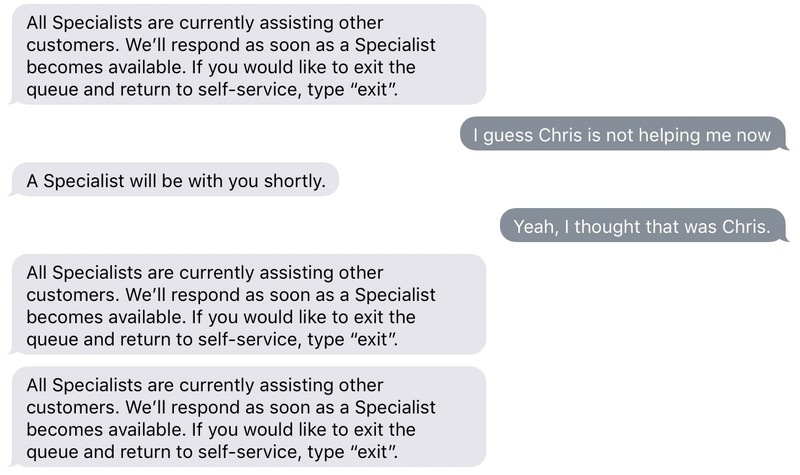 I had no reason to suspect I'd end up in a long term relationship with Apple support. The phone failed to complete authorization with Verizon. It rejected my PIN until my authorization was locked. No worries, I thought. I called Verizon and confirmed that my PIN was correct. They also confirmed that the new phone was indeed activated. Yet I couldn't get past the activation screen. Then the line went dead. So I pivoted and went for Apple Support. How do I make a Genius Bar appointment now? Not the Store app. Let's try the Apple support app. Nope. Let's try this link on the Apple page to start a chat. Verified business chat is a thing Apple is excited about so this will be good, right? Woefully wrong. The Apple iMessage chat is slow. This may be an actual human I'm texting but they clearly have a lot of more important things going on. Eventually they understand the problem and tell me that I must go into an Apple store for support. 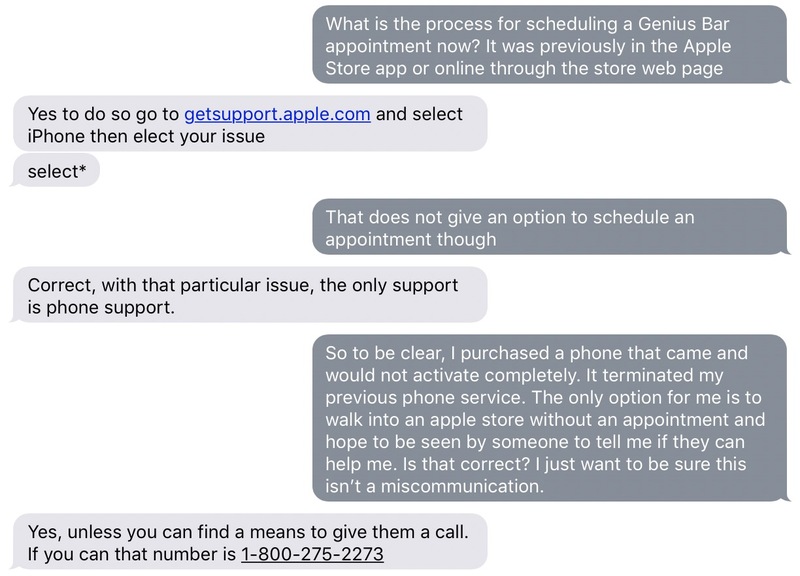 They also inform me that I can not make an appointment online for my problem but instead must call Apple support. Once again I remind them that my $1500 super computer can no longer make or receive phone calls. They "escalate" the chat. I repeat this comedy routine again with the next guy. Eventually my wife arrives with her functioning phone and I call Apple support. This is modestly more productive. The Apple phone support guy is friendly and seems to want to help. He confirms that I'm not the only customer with this problem and calls Verizon tech support. We both wait on hold until we are routed to someone that understands the cause and effect. Verizon confirms that "thousands" of customers are unable to activate new Apple devices. We try a hard reset of my new Xs. No luck. Our only option is to wait. He suggests I wait until the following day and try again. He re-activates my old iPhone. We part ways on friendly terms and feel like we bonded over a shared frustration with computers. I started with a call to Verizon customer support. After giving them a few moments to read the case I requested that they escalate my call to technical support as an open ticket. Verizon technical support is very pleasant and now they call Apple to initiate another 3-way troubleshooting call. After a few more SIM card swaps, hard resets, reference checks on the serial number, IMEI, and SIM IDs we end amicably but still dissapointed. I've been "escalated" to Apple engineering to resolve whatever issue is preventing authentication. I can expect a call. 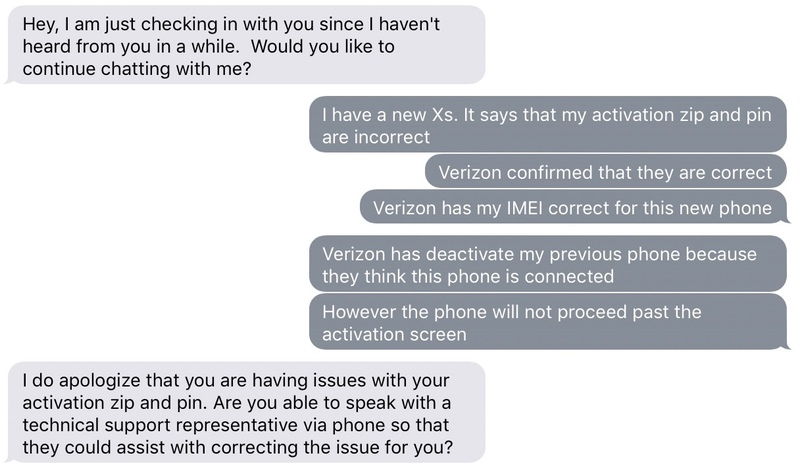 Many people are having issues activating phones purchased from Apple and activated through existing Verizon accounts. I've spent four hours between text chat, phone calls with Verizon, and phone calls with Apple. Most of it has been pleasant. At these new price points, I'd like for Apple to raise their bar for support. Apple's addition of iMessage chat is a net negative for me. Their removal of online scheduling of store appointments is also a downgrade in service.